Style: Rococo. Maker: Thomas Brooks. Style: Rococo. Depth: 25 in. (63.50 cm). Height: 29 in. (73.66 cm). 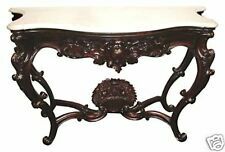 Antique Rosewood Bookcase - Chippendale / Rococo / D. João V' style. Bookshelf made with Jacaranda (Rosewood) - solid wood with five shelves. Antiguidade Armário/estante em Jacarandá - Estilo Chippendale / Rococo / D. João V. External cabinet structure: 1.66m / 5.44ft. 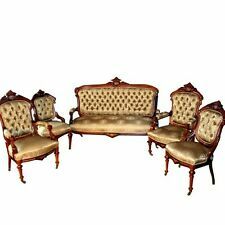 7279 Antique 19th C. 5-Piece Rosewood Rococo Parlor Set. Beautifully upholstered in periodic champagne fabric in the Hawkins pattern. Includes a sofa with a pair of matching armchairs and a pair of side chairs. 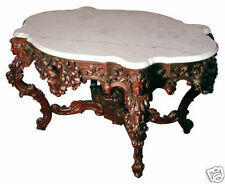 Style: Rococo Revival. This is a wonderful piece particularly because of its high quality. Very elegant with a very sturdy build that has a delicate look and feel. Reference No. : 6335. Style: Rococo. 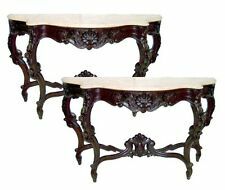 Year: 19th C.
Here is a gorgeous matching pair of Victorian antique chairs. 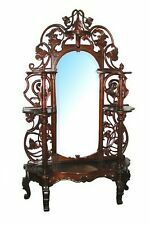 The arm chair is made of rosewood and the second chair of solid walnut. They are upholstered in an elegant beige velvet fabric with no tears. Maker: Alexander Roux. Marble is original with a 3/4" plug directly in the center. Origin: USA. Year: c. 1850.